Most of this visit was spent in Nairobi which I enjoyed. The Rift Valley was an exceptional sight but the Masai Mara Reserve was the highlight. It is such an open park - you can drive around wherever you want and have a truly wild experience. There is also the added bonus of meeting the Masai people who are incredibly friendly. As we crossed the border the rain started in its usual torrential downpour fashion and lasted about ten minutes. Customs was first and they were nice as pie - then asked for the "overtime fee" as it was Sunday. No no no no no we were not starting that game again and we refused to pay. They did have notification of this fee pinned to the wall - hand written on a scrap piece of paper! Immigration was easy and 3rd party insurance so expensive ($42 for one month) that we decided not to bother and to seek out a policy in Nairobi instead. By the time we left the border it was getting dark and we hoped to search out a campsite pretty quickly. Eventually nothing was sighted so we made the most of the darkness and sneaked off into a secluded field to bush camp for the night. In the morning we were greeted by locals who chatted for a while then asked us for gifts. A ten hour sleep was of great benefit despite being disturbed by Gordons car alarm going off in the middle of the night due to a fly affecting the ultrasonics. The road ahead towards the Masai Mara Reserve was very pleasant and locals greeted us as we drove by. We stopped off at a village to try and get some provisions, including meat. We were told the meat wasn't ready as the butcher was still at the slaughter house. "Come and see" he said. I was a little apprehensive but decided that it would be a character building experience to witness such a thing. After a short walk we arrived at the shelter which was being used as a slaughter house but were too late to see any action. Just a few carcasses were lying around. They were apparently waiting for the health inspector before they could sell us any. (Likely story)! After half an hour we were summoned to the butchers where we asked for 2kg of fillet steak from a cow. The carcass hanging up was rather small but there were a number of small cows around so we didn't question the man as he started to chop off two thighs. I didn't think this was where fillet steak came from but not being an expert in bovine anatomy I wasn't in a position to challenge the butcher despite asking for confirmation that this was cow fillet. The meat cost a grand total of £3 and when he handed it over in a plastic bag.....it was still warm. Ugh. I felt a bit sick and momentarily considered becoming a veggie. The contents of my bag had been walking around an hour ago. Throughout the remaining journey to Mara I stared guiltily at every little cow we passed. The next part of the journey towards the entrance of the Masai Mara Reserve was very interesting. The road got worse as we approached the escarpment and we were given the choice of many tracks down the mountain. We obviously chose the wrong one and found ourselves in first gear in low box traversing down the mountainside trying to avoid thorny bushes, gullies, trees and rocks galore. At the bottom we were met by locals telling us we'd gone the wrong way. Really! They said that one of their tribe would guide us for the rest of our journey as a woman carrying a big suit case ran over and ensconced herself in Comet, obviously wanting a lift. We reached the park gate. It is an unusual park because it is a Reserve (rather than a Park) where local masai can use the land for grazing their cows (probably a government compromise after feeling guilty about taking the land away from the masai in the first place). As such, there is no boundary between what is Reserve and what isn't and the entrance to the Reserve is simply a gate in the middle of a field and looks rather stupid as you can nip around the corner and sneak in. Anyway, we paid our park fees of $27 per person per 24 hours, approx. £4.50 for the car for the duration of the stay and the same per person for camping for the night. We entered the park at 4pm just as shadows were lengthening and colours changing to golden. At Governors Lodge ($250pp/per night) we tried very hard, albeit without success, to get a freebie balloon ride but they weren't playing. Instead we got three bottles of tonic as we couldn't afford beer at their prices. Passing masses of elephants we headed off with our tonics to the camping area (not a site - no facilities) next to the Mara River. What a fantastic location. It challenged Chizarira in Zimbabwe for top votes. The river is about 15m below where we camped and as dusk approached we sipped our G&T's and watched the crocs doing nothing and the grunting hippos exiting the water for their nocturnal prandial activities. We were surrounded by baboons and kept a look-out for thieving ones. Once it was dark the torch light revealed many eyes looking at us. There was nothing between us and the wildlife. Such nights see the re-emergence of the potty. Without hindrance Andrew got the fire going and we put half of our 'fillet steak' (from the thigh of the small cow) on the braai. Talk about a chewy experience. Not quite the steak we had hoped for. In the morning we awoke to the sight of the elephants doing a walk past. Beautiful. The baboons were active, the hippos back in the water and the crocs basking, open mouthed in the sun. After a cooked breakfast at our superb location we were soon inundated by local masai and their wares for sale. More and more came along and it turned out to be quite an event. They wanted money for taking photos and eventually Gordon agreed to one photo of a gang posing on Comet. In fact he took two. Andrew used the digital camera to show them a photo of themselves - but of course this wasn't a proper photo so shouldn't be considered as worthy of some cash. Gordon showed them what it was like to look through a video camera. They didn't realise it was recording all the time and he has some good footage of the locals in their proper attire. Some of the masai speak only Swahili, others speak the most brilliant English. They constantly amazed us. They load their ear lobes with earrings until the hole is huge and the loop able to pass over the whole of the ear. 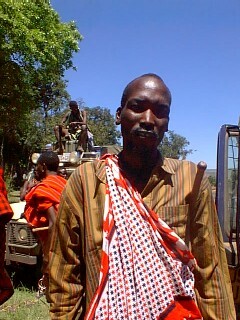 The red worn by the masai is visible from a long way off. It scares off the lions! 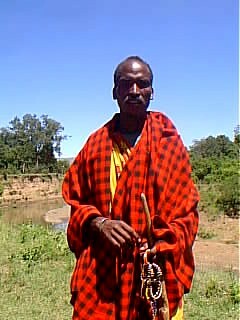 The masai no longer carry spears in the Reserve but do have machetes. A masai warrior has to kill a lion before being a fully fledged member of the tribe. Due to the lack of facilities we had not been able to have a shower for days. I had just started to have a wash when the locals arrived so I shifted to behind Comet. Half stripped off a Land Rover drove past full of clients from the expensive Governors Camp. They obviously got more wildlife than they had bargained for. 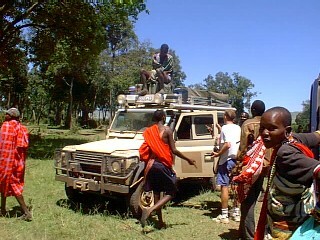 One of the masai was James and he promised to take us to see leopard. First he took us to see lions, then giraffe. It is such a free area - you can drive wherever you want to, right amongst the animals. You can also camp wherever you feel like it. Afterwards James took us out of the reserve via a sneaky route and into a woodland area where there are apparently leopard. No luck tonight but they are notoriously elusive. At the Mara River Lodge we bought beers at staff prices along with some bread before paying a local masai to stay on his land at a different location along the river. Again the hippos entertained us. That night we had a stew with the remaining fillet steak and came to the conclusion that the meat was goat. Those locals at the butchers must have had a right laugh at us muzungos (white guys) buying goat and thinking it was beef. On Wednesday 29th we were up early to go leopard spotting but after hours of driving around found nothing. We did get to see a lot of Eland though which was quite a Brucie bonus. 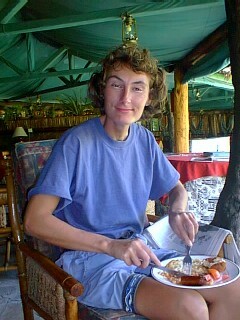 After a hard mornings safari we decided to go to the Mara River Lodge for breakfast. Oh what a treat. 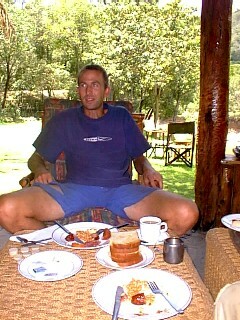 On wicker chairs overlooking the river we tucked into fruit, fruit juice, cereal, bacon & eggs etc. The lodge even had a flush toilet. We played games, read the newspaper and generally lived it up for a few hours before setting off again on another leopard hunt. James was with us again and we doubted his ability as a guide. 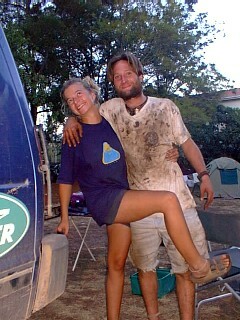 However, he did do a good job at extracting money out of us for camping fees. 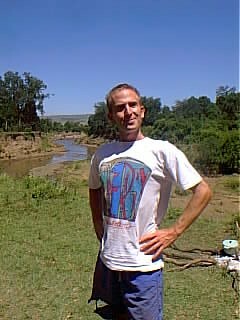 That night we camped next to the river in an area near to where the leopards supposedly hang out. As night fell, zebra and giraffe passed us as they walked to the river to drink. Late the following morning we left the area having spent most of the time out of the Reserve. We saw very little of it and would like to return at some point. However, we certainly didn't miss out on the animals - except leopard. The Masai Mara is fantastic. We made our way to Nairobi via the spectacular rift valley. What a glorious sight, especially in the low light of the day. Nairobi greeted us with bright lights, police in familiar jackets, roundabouts, supermarkets and signs for 'farmers choice sausages'. The stories about Nairobi (known as Nairobbery) are not good but so far we were delighted. At Upper Hill Campsite (conveniently located in town) we were met by Noel and Sally who had arrived just before us. Beers, tuck and a lot of chat followed as we made plans for the next part of the journey. The next day was busy with administrative matters and visits to the local cafes that sell fish and chips. What a delight. Kenya is much cheaper than Tanzania and we stocked up with delicious food from the local supermarket. That night the chaps cooked bangers and mash with onion gravy for tea. These were the first proper snorkers since The Gambia. Over the next two weeks we were all busy doing things to the cars and making onward route plans. Andrew worked on the car at Tipsy Garage getting a few bits galvanised and fixed while I replaced the rather shoddy mozi nets in the tent. Gordon had some cupboards built in the back of Comet. Lots of administrative matters were taken care of - mainly with the assistance of James in the UK who is forever being inundated with tasks from us. Trying to arrange things from here is very difficult, especially when the telephone calls cost £2 per minute. We spoke to a lot of people about potential routes up north. Many have crossed Algeria, Chad, Niger, Sudan and Ethiopia with minimal problems. All were in agreement to avoid Egypt though as the costs are huge ($1000 just to get your car in). We were given maps and GPS co-ordinates and lots of top tips. Even a meeting with the consul at the Libyan Embassy proved positive (although he didn't know a great deal about border situations because the embassy had only recently re-opened following the lifting of international sanctions). Libya was certainly high on our list of places to visit. Despite its reputation I really like Nairobi. The centre of town is very small and it is possible to buy everything and anything. Shopping is really easy as the sewing shops are in one street, the chippies in another. The book shops are together as are the insurance brokers. Internet is fast and the supermarkets are full. I bought a soapstone chess set with animal shaped pieces and managed to break an antelope as I was unpacking it. The price started at £32 but I was happy to part with £4. So were they, eventually, so they must have still made a profit. Whilst visiting the sewing place near to Kenyatta Hospital a hearse passed. It was a minibus with upright seats! Not a good advertisement for that hospital if the stiffs have seating space. We visited the cinema twice, once to see "The Matrix" which we thoroughly enjoyed. Now we know where Andrews Nokia telephone disappeared to in Ghana! The second film was meant to be the Bond movie but we were a day late and ended up seeing "Sleepy Hollow" which rates as one of the worst films I have ever seen. April 6th was the anniversary of one years travelling and as we celebrated with a bottle of fizz we heard news of the famine in Ethiopia and the closure of one of the Sudanese borders. This would change our travel plans drastically. Even the route back south is limited by the problems in Zimbabwe. As riots start to build up and the anti-white feelings escalate this would not be a good time to re-enter the country. Perhaps this is just-desserts for what the colonialists did last century. People that have recently travelled through Ethiopia reported seeing no signs of famine and had no problems getting food, although the choice was limited. Various news reports and fellow tourists suggested that the Ethiopian government is spending its money on its war with Eritrea rather than buying food for its population. Our biker friend Chris turned up at the campsite - without bike but with bandage. He'd hit a lying log in one of the parks in Malawi and shot off his bike, landing on his shoulder. A broken collar bone put him out of action for four weeks so he decided to fly home for the duration and see family and mates. He'll be back next month to continue his journey to Cape Town. One funny episode was when Gordon and I went into town and made the most of the calm traffic conditions to cross the roads easily. What we hadn't realised was that everyone had been stopped to allow the presidents motorcade to pass through. We just carried on walking until we got honked at by one of the official cars. Eventually the jobs started coming to an end. Punda was sparkling again and Comet furnished with a set of cupboards. The Zimbabwe and Ethiopia situation continued to get worse and there was a temporary closure of the Moyale border (between Kenya and Ethiopia) due to riots so we decided to go to Uganda and planned our route. By now, Sally and Noel had gone on ahead of us. Before leaving Nairobi Andrew and I had a very pleasant evening with Tipsys family at their home where we were invited for dinner. There were quite a number of guests and despite being Sikh our hosts served us delicious chicken curry (Sikhs do not eat meat) alongside other beautiful Indian dishes. I now have a greater understanding of the Sikh religion as well as an enhanced passion for curries. By Thursday 20th we were ready to hit the road. 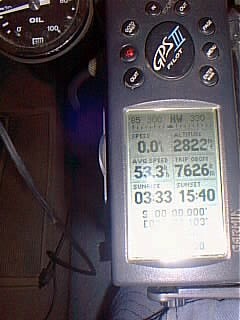 The long awaited journey was finally with us but we only made an hours progress before we got a puncture. That delayed us for a while. The road north along the Rift Valley was very pretty and the excitement built as we approached the equator. We had expected there to be masses of souvenir stalls but there weren't. Quite pleasant really. A big sign marks the spot and matched with where the GPS changed from 0°south to 0° north. Back in the home hemisphere (for now)! We had to make a double take as we continued along the road where cows, goats and donkeys grazed with zebras. Zebras! The campsite at Eldoret was lovely but we only had enough time to set up camp and have dinner before going to bed as we planned an early start in the morning. We were up at 5am as we planned to meet Gordons friend, Jeremy in Kampala at lunch time. The sunrise was beautiful and welcome too as the light revealed worsening potholes towards the border. By 8.15am we reached Malaba and hoped the border formalities would be quick. 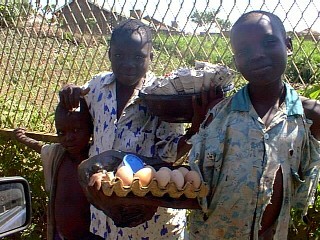 As it was Easter Friday the border officials were on overtime and demanded payment for such. Having observed the locals make the same payment it all seemed to be official (to a degree). This is the busiest border between Kenya and Uganda but we finalised the Kenya formalities quite quickly. The same could not be said on the Ugandan side! Food outlets in Nairobi vary. There are the Steers, Debonaires and Nandos chains if you want burgers. If you prefer local food there are loads of cafes which offer fantastic food at really cheap prices. Chips are a favourite, particularly served with masala or chilli sauce. Food of Indian origin is very popular, particularly samosas. You can get the old British favourites - sausages and pies. Freshly squeezed orange, mango and passion fruits are cheap and delicious. Mandazi is very popular which is like a doughnut and can be served as a savoury or sweet. Eldoret via Nakuru. Equator crossing. Avoid buying 3rd party insurance at the border. Instead, buy it in Nairobi. At Blue Shield you can buy a three month policy for 1500 shillings (£15). Avoid the Malaba border crossing into Uganda. Take the quieter Busia crossing instead. Try to avoid taking matatus (minibuses), particularly at night. There is a real danger of being involved in an accident or being robbed. For UK citizens entry into the country is free for up to 30 days. A visa or a stay of longer than this time costs $50 per month. Road tax is only payable by lorries. There is no road tax due on cars. Perhaps there should be to help pay for mending the dreadful roads. You can buy a "yellow card" from Kenya (first country we managed to find it) which is an umbrella cover for all south and east African countries. From Blue Shield we got 3rd party cover for three months for 3500 shillings (£35). You have to buy local insurance too. It is much cheaper than individual policies in each country you enter. If you have a student card you can get into the parks at a much cheaper rate. You can have cards made up for £1.50 in various printing booths along Moi Avenue in Nairobi. For Landy spares go to Impala in the Industrial Area on ? road or ??? out near Rafiki, on outer ring road. For bodywork, welding etc, on your car go to Tipsy Motors in Nairobi. (Mombasa Road) Tipsy ('That's super cool man') and brother Raju offer excellent service and hospitality. (S: 001° 017' 018, E: 036° 048' 821). Thanks very much guys. For mechanical work on your Landy visit Land Marque Ltd. This is a new company owned by Paul Imison and he has a team of three excellent chaps working with him. They can be found at 60 Forest Lane, Karen. (PO Box 21110 Nairobi, Tel. 884637, Fax. 884638, Mobile. 072-512426, email. imison@form-net.com. The workshop is based in the grounds of Paul and Lucys home which is very close to the facilities of Karen, including the home of Karen Blixen (she who wrote "Out of Africa"). There is Karen Country Club nearby where you pay 300Ksh (£3) for a days facilities including swimming, gym etc. Camping options are currently being planned on site as it's important to be near your baby when work is being done to it and often the work overruns.... hence... where do we sleep tonight?. Land Marque Ltd can be found at S.01.20.829, E036.42.518.